Files are frequently changed as they go through rounds of approval, and move along the printing process. Errors often slip through undetected. This platform will help you manage all your quality control from a single source and catch any errors before they go to print. Compare two files: Global Vision automatically compares your working file to a previously approved file. Inspect for errors: Any differences between the two files are flagged by Global Vision. If you are interested in Quality Control Platform, let us know and we'll make you a quote. With fast and efficient inspections, you’ll streamline the entire proofreading process. With inspections available at every point in the workflow you’ll get packaging released on time and without setbacks. Our platform meets FDA requirements including 21 CFR Part 11. GlobalVision integrates into your workflow system through the SDK or customizable APIs. Access to the full history of your inspections for total compliance and legal protection. Adjust the error detection’s sensitivity to catch even the slightest differences, so nothing will be missed. Annotate changes directly within GlobalVision to track and approve errors. PDFs are loaded directly into the software for faster loading and switching of layers and separations. New Workflows and Job Wizard functionality to simplify the inspection process for print production or press operators. Ability to view Inspection Reports directly within the software without an external PDF Viewer. Improved speed when loading PDF and AI files with new multi-threaded rasterizing. Improved file loading speed for multi-page PDFs and booklets. Ability to specify a default directory to save Inspection Reports. Automatic report filename generation (combination of Product ID and Lot if entered). Ability to specify a default directory to save image views. Ability to rotate images in the Master/Sample Panels after inspection. Ability to navigate through multi-page files after inspection. New color-coded buttons for difference levels in the Difference Details panel. Ability to locate the difference in view easily in the overview panel to identify on the physical printed sample. Repeats are identified by row and column numbers. Improved visibility of Repeats in Overview panel by removing Number overlay. New quicker inspection mode for press sheet inspections (One-to-One). Ability to right click and select an alternate shape for artworks with multiple dielines with the same color. Ability to scan automatically directly into the software without a scanner interface. Improved speed for barcode detection with new multi-threaded inspection. Improved the speed of detection of EAN/UPC barcodes. Support for Code 32 barcodes. BWR is supported for all barcode types (exception: Laetus Pharmacode). Bar Width Reduction (BWR) is displayed in inches as well as millimeters in the report. Ability to select the following parameters to include when grading barcodes: Data Structure, Quiet Zone, Narrow Bar, Wide to Narrow Ratio. Option to fail grading if Bar Width Reduction (BWR) is out of specified range. Parameter added to adjust narrow bar measurement to not include BWR (INI file setting). Default: BWR is included in the measurement. Unified English Braille (UEB) added to Braille library. Removed ability to enter product information (i.e. Product ID, Product ID and Lot) prior to an inspection to pre-populate the Inspection Report (replaced by new job functionality). Differences are no longer classified as Insertion, Deletion, Change. C/CPP/H file format types not supported. “Inspection: Successful” field removed from Inspection Reports as Status field is displayed. TIFF file with JPEG compression loads properly (sample specific). Improved display of colors in loaded TIFF files. Colors in TIFF files no longer oversaturated (sample specific). Repeats are no longer distorted/skewed when <Correct distortion, rotation and skew> is enabled (sample specific). Marquee and Trim region modes applies to all pages (All Pages Unsorted action) when an inspection is run from a separate page other than the one on which the region mode was applied. Crop/Trim/Media Box selection applied correctly to pages after pages are reloaded and changed prior to inspection. Overprint is applied correctly to all pages in the Master/Sample Panels after being enable/disabled. PDF file loads correctly with or without Enable Overprint (sample specific). Master and Sample Information panels do not display in the Inspection View (after being opened and not closed previously). Ability to group (include/exclude) multiple differences even if the differences are not selected in the difference list. Inspection View (Forward) icon no longer displays after a failed multi inspection. Ability to apply marquee and trim to all, even or odd pages. Golden master image is labeled on the Inspection Report when the Master is included in the report. Error message explaining lack of Multi Inspection support for Braille Compare (Glue Dots) clarified. Region Mode is set to Full Page by default. Image Padding no longer enabled by default when creating a new profile. Profile names display correctly when containing ampersands. Graphics profiles can be imported on Macintosh systems. Barcode Inspection results are consistent between Macintosh and PC systems (sample specific). BWR displayed with four digits after the decimal point in inches instead of three. German Braille translation displays correctly (sample specific). Bulgarian Braille detected correctly (sample specific). Ability to use the tab key in the User Editor form to add information. Audit Trail events listed in proper chronological order when sorted by date. Audit Trail description for Full Name edit corrected to indicate that the Full name was edited. Audit Trail description for Compare (Glue Dots) no longer references app data folder. Temporary directories deleted upon exiting the application. TIFF files on Macintosh load properly (sample specific). Quit button to exit application no longer grays out on a Macintosh (specific scenarios). Correct profile names listed in the Inspection Report for Standard (not Admin) users. Application no longer crashes when saving a Single to Many Inspection Report after previewing first. Inspection Reports can be overwritten when saving a new report directly from Report Options window. Updated license server library to fix licensing issues and to allow for Licensing Key Manager option. Ability to modify the Standard options (Brightness, Contrast, and Gamma) on the Scan360. Last selected Scan360 profile is maintained in Profile drop-down (does not revert to default). Preview window zooms into scanned image correctly (Scan360). Webinar - Get to know Quality Control Platform! 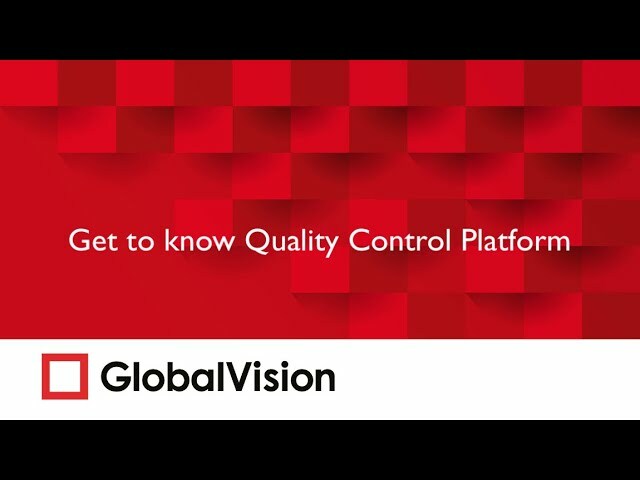 In this webinar, we will go over the seven different modules of Global Vision Quality Control Platform. We will show you how to work with Graphics Inspection, Print Inspection, Barcode Inspection, Braille Inspection, Text Inspection, Spelling Inspection and the newly released Color Inspection, using realistic examples. As the longest automated proofreading solution on the market, their software is the first to be available on the cloud. We’ll work with your IT department for a smooth integration no matter how your process is set up.